Since a honeymoon is one of the most special moments in your life, it's important to make sure that the destination, resort and/or cruise ship is the perfect choice for you and your loved one. There are a lot of things that go into making the right choice, whether it's the time of year you're looking to travel, the type of accommodations you'd like to stay in, or the budget that you have. Our travel experts are here, ready to make planning your honeymoon as simple as possible for you. In fact, they strive to do all of the researching for you so that you can have as little stress as possible, since planning a wedding and honeymoon can be a lot of work! 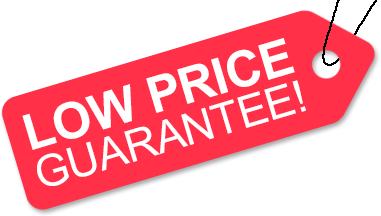 Besides our great service, we also have great honeymoon deals…contact us today! In addition to honeymoon packages, we also offer destination wedding packages. For more information please check out our destination wedding page. The following are just a few of the most popular honeymoon destinations (listed alphabetically). Please contact us if you'd like more information on any of them, such as pricing and availability for resorts and/or hotels located within them, or if there's a destination you're interested in that isn't listed. We have great honeymoon deals to any destination you could ever desire! Among the most popular Greek Isles for honeymoon travel are Corfu, Mykonos, Rhodes and Santorini. These islands are breathtaking, with rich culture, long and fascinating histories, beautiful beaches, sapphire waters, luxurious hotels, welcoming locals and unique Greek architecture. Those that love dramatic, mountainous views should certainly consider a Greek Isles honeymoon. We can arrange romantic honeymoons in which you travel from island to island throughout your trip, allowing you to truly experience this region. One of the most romantic honeymoon destinations in the world, Hawaii is hands down one of the most popular honeymoon destinations, for both land-based honeymoons and cruises. From its beautiful white- and black-sand beaches and volcano's to historic sites like Pearl Harbor, there's really something for everyone in Hawaii. A major plus is that the Hawaiian Islands are a year-round vacation destination with tropical weather all year long, making a Hawaii honeymoon a great choice regardless of when you're looking to travel. There are many areas of Italy that would be a great choice for a romantic honeymoon destination. Among the most popular areas are the breathtaking Amalfi Coast (including regions such as Positano, Capri and Ravello), the historic city of Rome (home to famous landmarks such as the Colosseum and Roman Forum, as well as the Sistine Chapel and St. Peter's Basilica in Vatican City), the wine country of Tuscany, as well as the impressive canals of Venice (which you can take a romantic gondola ride through). Featured on many Western Caribbean cruises, this island is filled with beautiful beaches, fantastic resorts, rich culture, historic sites and breathtaking natural wonders. Among the highlights of a honeymoon vacation in Jamaica is the opportunity to visit Dunn's River Falls in Ocho Rios, a Jamaican national treasure, and relax at Seven Mile Beach in Negril, one of the most beautiful beaches in the entire world. Jamaica is home to several of the most romantic resorts in the world, so it's an excellent choice for a romantic honeymoon. Filled with all-inclusive resorts and beautiful hotels, this east coast region of Mexico is a fantastic choice for a honeymoon vacation. If you're looking for a lively honeymoon, with lots of bars and clubs, then you should definitely consider a honeymoon in Cancun. However, if you're looking to stay at a luxurious resort with more "alone time," as well as fantastic beaches, you should think about Riviera Maya (40 minutes from Cancun). Maroma Beach, located in Riviera Maya, is one of the most beautiful beaches in the world! Located in the Eastern Caribbean, St. Lucia is one of the most lush and beautiful islands in the world. This exotic island is featured on many Caribbean cruise itineraries (for those looking for a honeymoon cruise), and is home to a few resorts that would make the perfect setting for those looking for a land vacation for their romantic honeymoon. Among the many things to do while in St. Lucia are diving, snorkeling, hiking, yachting, wind surfing and (of course) enjoying the sun, beach and spa treatments! The French Polynesian island of Tahiti is hands down a top choice for a honeymoon, whether is be land-based or a cruise. Located in the South Pacific, this exotic island is filled with beautiful (white- and black-sand) beaches and fantastic resorts. One of the most popular accommodations that are offered at some of the Tahitian resorts are overwater bungalows, an excellent choice for a romantic honeymoon vacation. Besides the beaches and resorts, there's also rich culture and history to take in while vacationing there. A cruise is a very popular choice for a honeymoon vacation. Some of the more popular honeymoon cruise destinations are Hawaii, Tahiti, the Caribbean, Mexican Riviera and Europe (especially the Mediterranean). Being that a honeymoon is such a special once in a lifetime event, most honeymooners prefer to purchase a stateroom with a balcony, or a suite, for their honeymoon cruise. However, being able to purchase a cruise in an interior or ocean view stateroom is a great option for those looking to take a honeymoon on a budget. Besides the cruise itself, we can arrange for many special amenities and events for your honeymoon (depending on the particular cruise you choose). Such arrangements may include special gift baskets, exclusive meals, guaranteed dining room seats for two, roses, flowers, bathrobes, portraits and much more. Most of these services are available at an additional cost, but are well worth the memories and enjoyment that they'll add to your honeymoon. The newer Carnival ships, Carnival Breeze, Carnival Magic, Carnival Dream and Carnival Splendor, feature Cloud 9 Spa staterooms, a favorite among honeymooners taking a Carnival cruise. These accommodations feature special in-room spa amenities (including Elemis products), and guests staying in a spa stateroom get special spa benefits. For example, such guests get are priority spa appointments (including concierge consultation), complimentary fitness classes (2 classes per person), spa towels, bathrobes and slippers (all only for use during the cruise), and unlimited use of the Thalassotherapy Pool and Thermal Suite (a $40 per person per day value). Also on select Carnival cruise ships is the Serenity Adult-Only area, a kid-free oasis where guests can relax, read a book or chat with other guests. NCL features a fabulous variety of suites that would be perfect for a honeymoon, such as their Romance Suites (up to 504 square feet), Courtyard Villas and Garden Villas. Guests staying in an suite enjoy benefits including priority embarkation, luxury baths, as well as butler and concierge service. 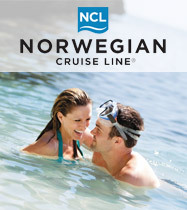 NCL also offers a nice selection of Honeymoon and Romance packages. For example, their Deluxe Romance Package includes: Sparkling wine and strawberries in your stateroom on embarkation day, choice of Mandara Spa® Exotic Frangipani Body Nourishing Wrap or Exotic Coconut and Milk Ritual Wrap for one, two 25-minute Mandara Spa® half-body Seven Seas Massages, tea service in your stateroom on the afternoon of your choice, breakfast in bed on one day of your choice, a beautiful keepsake formal portrait, and romantic dinner for two in Le Bistro with a complimentary bottle of wine. Princess, the owners of the "Love Boat," features a nice selection of accommodations onboard their ships, from basic interior staterooms for those on a budget to large ultra-luxurious suites. Princess also offers a variety of special honeymoon packages that can be added onto any reservation. The Sanctuary is an (adults-only) outdoor spa-inspired area, available on select Princess ships. While in this area you'll have access to special beverages, light meals, massages, attentive service and relaxing personal entertainment (such as MP3 players for rent). 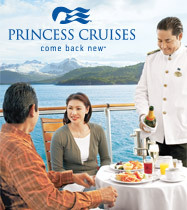 Princess also offers the Ultimate Balcony Dinner, which is an optional add-on where you can have a four-course meal on your stateroom's balcony, with the choice of lobster, steak or surf-and-turf as the main course. Royal Caribbean features some of the most beautiful accommodations at sea, including huge suites that are sure to satisfy your honeymoon desires. One of Royal Caribbean's big attractions is their large variety of cruise ships that feature state-of-the-art onboard amenities. The impressive Vegas-style Casino Royale is onboard all of their ships, as are great dining options (including specialty restaurants), a variety of bars, lounges and night clubs, as well as large theaters that host live nightly performances. Depending on the ship you pick, there may be a Royal Promenade, ice skating rink, rock-climbing wall, and even a FlowRider® (surfing simulator). It's hard to run out of things to do! For those looking for relaxation, there is a great spa onboard each of their ships that has a nice selection of treatments to choose from. Those looking for a truly luxurious honeymoon cruise should consider the all-inclusive Italian-inspired cruises offered by Silversea Cruises. Their upscale cruises include complimentary beverages (including a great select of wines and spirits), gratuities, 24-hour room service and destination-rich itineraries. On a Silversea cruise you're going to sail on a beautiful European-styled ship, featuring fine-dining (prepared by acclaimed chefs) that can be compared to some of the world's most renowned restaurants. The superior service all guests benefit from is made possible with a well-trained staff and fabulous staff-to-guest ratio. Guests staying in an Owner's, Grand, or Royal Suite benefit from the service of a dedicated butler. 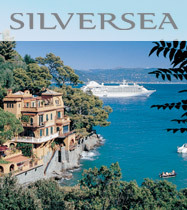 If you'd like to experience a truly luxurious, hassle-free honeymoon you should certainly consider a Silversea cruise. 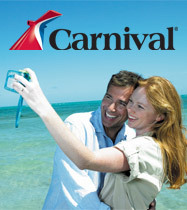 Looking for a different cruise line? 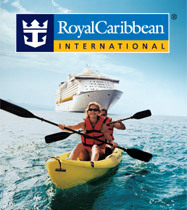 View all cruise lines!